Kolkata is the current capital of the state of West Bengal and was also the first capital of the British in India. It was established in 1686 when the British shifted their operations to the small villages of Govindpur, Sutanati and Kalikata from their trading port of Hooghly. It flourished and prospered until in 1756 Siraj-Ud-Daula (Nawab of Bengal) attacked the town and drove the British away. Lord Clive then later regained control of Kolkata and until 1911 it remained the capital of the British government in India. Having been the centre of power of the British for so long has given Kolkatta a unique culture and heritage that is quite unlike any other city in India. 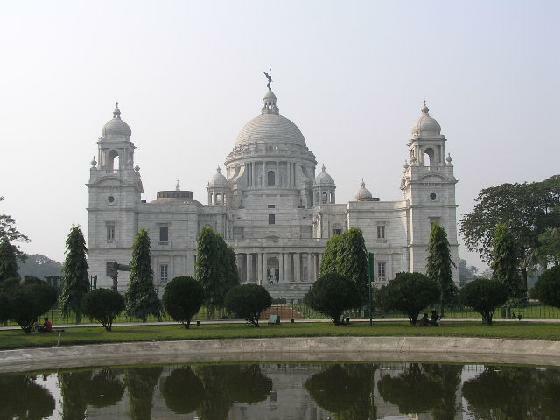 Not only Kolkata entire West Bengal takes pride in this magnificent Victoria Memorial Hall which definitely is one of the most beautiful monuments in India. The first look of the hall styled in European and Mughal architecture will leave you mesmerized. The entire structure covering an area of 64 acres is completely build of white marble. The building was designed by Sir William Emerson and his assistant engineer Vincent J Esch. It was one of the biggest projects undertaken by British in India. Today the memorial hall houses arts and artifacts depicting the British period in India. There are statues of many British officers who served in India and of Queen Victoria right at the entrance. Birla Planetarium is the largest of its kind in Asia and the second largest in the world. Opened to public in 1962, it was constructed by Birla Education Trust. The planetarium can accommodate almost 500 spectators for a show. The central dome is inspired by the Buddhist Sanchi stupa and replicates it to some extent. Apart from holding shows, there is a collection of celestial models, statues of famous astronomers. It took almost 8 years to construct one of the most impressive structures in Kolkata. The construction of this Indo Gothic style building was started in 1839 and was finished in 1847. It was Consecrated in the year 1894. St. Paul's Cathedral is the first Episcopal Church of the Orient. The church was destroyed in 1897 by a major earthquake but was renovated quickly. It was again destroyed by an earthquake in 1934 after which the pattern of its structure was altered and the tower was made on the basis of Bell Harry Tower of Canterbury Cathedral. Inside the church the main hall contains intricately carved wooden pews and chairs. Indian Museum was established in 1914. First of its kind and still the largest in the country. The Museum has six sections : Art, Archaeology, Anthropology, Geology, Zoology, and Industry (Economic Botany). The Art Section comprises Tibetan temple banners, metal images, enamelled wares, bidriwares, ornaments, silver wares, glass wares, pottery, ivory and bone work, wooden sculptures, leather objects, lacquered toys. The Archaeological Section displays stone-age artifacts from India and abroad, pre-historic antiquities from Mohenjodaro, Harappa The Anthropological Section displays numerous objects of material cultures of both tribal and non-tribal peoples of India. The extensive Geological Section has over 80,000 specimens, displayed in four galleries showing varieties of meteorites, precious stones, ornamental building stones, rocks and minerals and fossils. The Zoological section, is rich with innumerable specimens of insects, fish, reptiles, mammals and birds. The industrial Section has several thousand botanical specimens bearing upon medicine, forestry, agriculture and cottage-industry. The Museum has a publication unit and a library. Kolkata is a well-known place where shopping is a great fun. From toys and junk jewelries to your fashion wardrobe, one can avail garments, shoes, belts, bags, fashion accessories, food joints and whatever needed. It does not matter which time of the year one is visiting the state, one will always be close to a festival as the entire year is filled with festivals. Some of the traditional festivals celebrated here are Durga Puja, Kali Puja, Naba Barsho, Jagaddhatri Puja, Holi etc.